Oblique aerial view centred on the remains of the broch, taken from the SW.
Oblique aerial view centred on the remains of the broch, taken from the WSW. 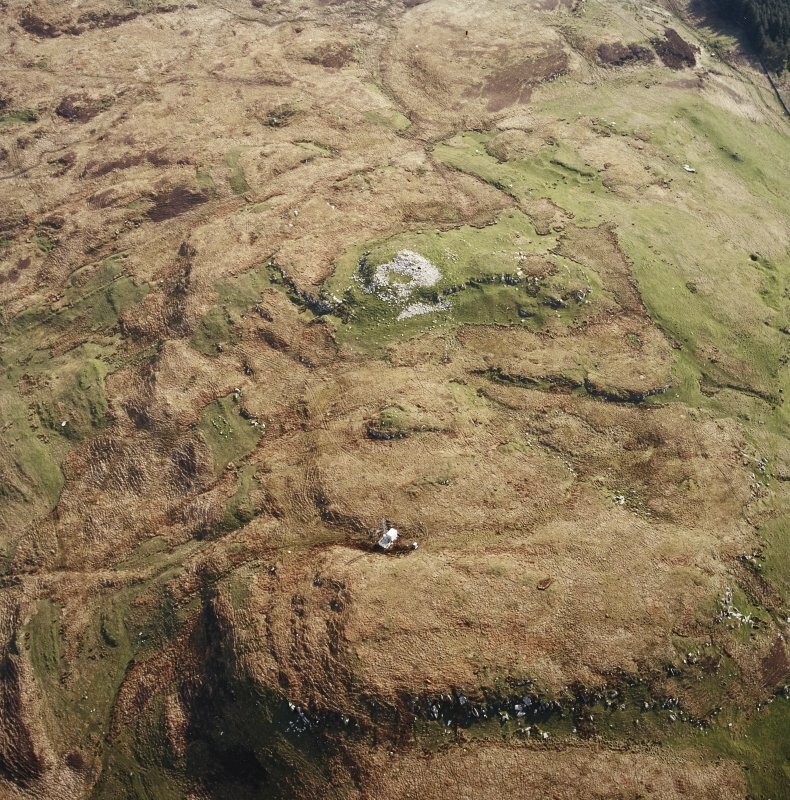 Oblique aerial view centred on the remains of the broch, taken from the NW. (East coast). Dun Bhoraraic broch, on a summit 550ft [168m] above OD and 3/4 of a mile from shorwe, commanding a superb view up the Sound of Islay to Colonsay and Mull, across the island to Loch Indall [Loch Indal], the Rhinns and ireland, and down the Sound to Kintyre. The entrance on the SE is well preseved, the passage being 13ft [3.96m] long and 2ft 4ins [0.71m] wide at each end, but widening out at [the] centre. To the left is a cell, entered at the door-passage. The corbelling of the roof is visible though the capstones have fallen in and the floor is choked with stones; [the] dimensions above these [are] 8ft [2.4m] by 4ft 6ins [1.4m]. The court is choked with fallen stones and [the] exact diameter is uncertain. The outer face of the tower wall on the SW has fallen down the precipice, but elsewhere its base at least is well preserved. In the thickness of the wall on the left (SW) side are traces of the stair. A little further round a passage leads to a cell, the corbelled inner wall of which is exposed by the collapse of the outer wall. A signal station with concrete piles has been built over the broch wall on the S (left). There are no certain traces of outworks. V G Childe 1935, no. 1. 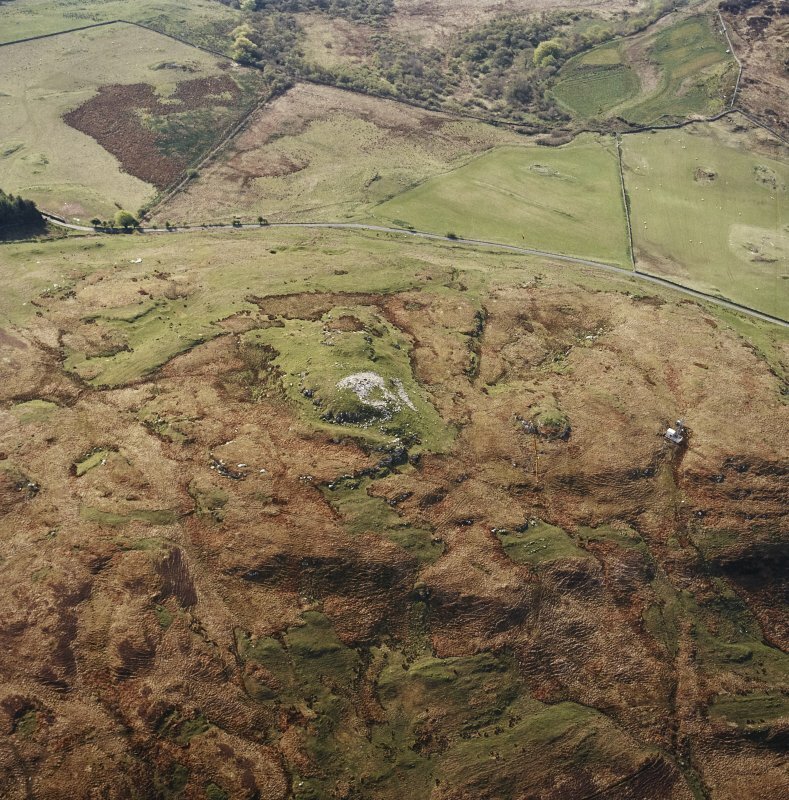 Dun Bhoraraic a broch (MacKie 1975; Newall 1965) stands on top of a low hill (619ft OD). It measures 36ft in diameter E-W by about 30ft within a wall some 13ft thick. The entrance is visible in the SE, with what appears to be a guard cell on its left. Childe notes traces of the stair in the wall in the SW, also a mural cell.The broch is well preserved though largely hidden under its own rubble (MacKie 1975). A signal station with concrete piles has been built over the broch wall on the S. There is no certain traces of outworks (Childe 1935). V G Childe 1935; F Newall 1965; E W MacKie 1975. Dun Bhoraraic (name confirmed), a broch prominently situated on a hill summit. It measures 13.5m internal diameter within a deformed wall 4.8m to 5.5m wide, which is largely obscured by its own tumble. The entrance has been partially cleared of stones, and displays a door check and guard cell; a further mural cell is exposed in the south-west arc. There is no trace of the stair noted by Childe, but what may be the face of a first floor gallery can be seen in the west arc. The footings of a recent mortared building (the signal station mentioned by Childe) overlay the broch on its east side. 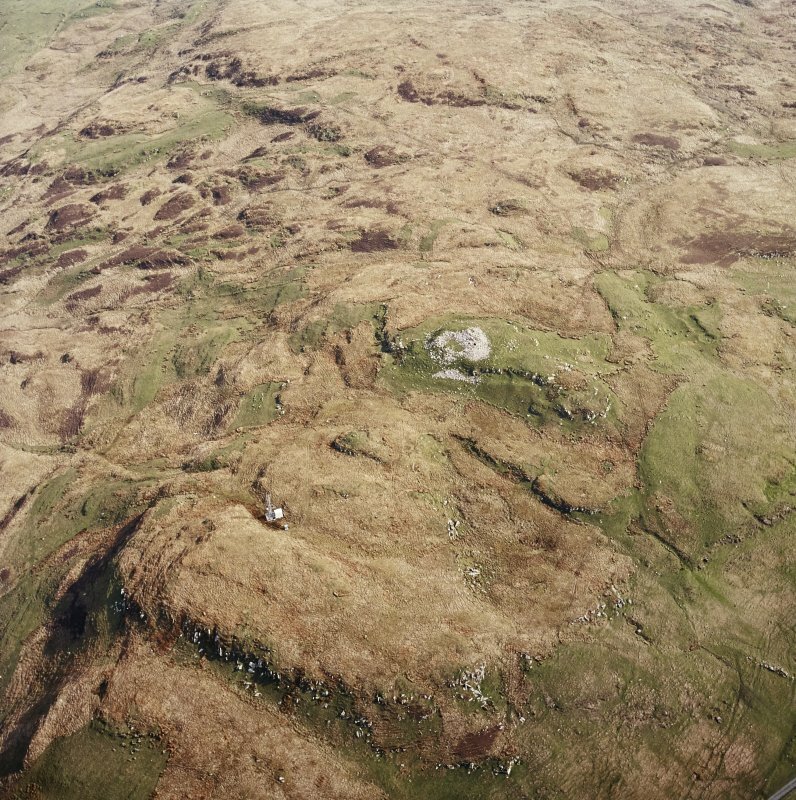 The broch is further defended by natural slopes to the NW, SW and NE; on the latter side it appears that the base of the slope has been cut back to the living rock, and the spoil deposited outwards to form a ditch and sinuous outer bank up to 1.2m. high. There are traces of outer ramparts to the NW and SE of the broch, but these survive as low bands of rubble of indeterminate width. Visited by OS (N K B) 5 April 1979.
commands extensive views in all directions, and from it a steep scarp falls away for 8.5m to the S and W, while on the NW and NE there is a broad quarry-ditch. This ditch is presumably what was described by Pennant as 'a deep foss' (Pennant 18): its inner edge is formed by rock faces 3.5m high and it has an external bank rising up to 2m above the ditch bottom. fallen down the slope to the W. Of the inner and outer faces of the wall, which were constructed of large blocks up to 0.9m by 0.4m, only one course is now visible through the rubble, but Pennant found the walls standing to a height of about 4.3m. The central court is now filled with rubble, and the scarcement, described by Pennant as 'a stone seat running all S round the bottom of the wall, about two feet (0.6m) high', only just appears through the debris as a shelf about 0.6m wide. Nowhere docs more than one course of the inner face survive above the scarcement. The entrance is on the ESE; at its outer end it is about 0.9m wide but it narrows slightly to a width of 0.7m immediately outside the door-check which was positioned 1.2m down the entrance-passage. The check itself consisted of a transverse slab behind which the sw side of the passage is set back to give a total width of 1m; this gradually increases to 1.2m, only to narrow again to 0.7m at the inner end. No bar-hole is visible. mentioned by Pennant are no longer in situ. The widening of the entrance-passage behind the door-check may have been partly to provide easier access to a guard-chamber set in the thickness of the wall on the sw side. Access to it is provided by a narrow passage (a on RCAHMS plan, [RCAHMS 1984]) about 0.7m wide; the lintels that form its roof are now only 0.7m above the rubble on the floor. The walls of the chamber itself, which are corbelled, are visible for a height of 1.2m and enclose a space measuring 1.8m by 1.5m. At the extreme sw end of the guard-chamber a little of the wall-face has fallen away to reveal an ascending series of lintels or treads above a void within the thickness of the wall; this structure may have carried a gallery over the guard-chamber and across the main entrance-passage. Pennant's description mentions that there was 'a hollow, probably intended for guard-rooms' on each side of the entrance-passage but there is now no trace of any chamber on the NE side. If one existed, then access to it must have been from the central court, unless Pennant was referring to structures then visible at a higher level. function and their relationship to one another are uncertain, although Pennant states that the walls had 'within their very thickness... a gallery, extending all round'. marks the position of the entrance through this outer wall. solid round projecting angle-bastions overlie the ruins of the broch; it is in turn surmounted by a modern marker-cairn. Dun Broraraic broch, on a summit 550 feet above O.D. and 3/4 of a mile from shire commanding a superb view up the Sound of Islay to Colonsay and Mull., across the island to Loch Indall, the Rhinns and Ireland down to the Sound to Kintyre. The entrance on the south-east is well preserved, the passage being 13 feet long and 2 feet 4 inches wide at each end, but widening out at centre. To the left is a cell, entered from the door-passage. The corbelling of the roof is visible though the capstones have fallen in and the floor is choked with stones; dimensions above these 8 feet by 4 feet 6 inches. The court is choked with fallen stones and exact diameter is uncertain. The outer face of the tower wall on the south-west has fallen down the precipice, but elsewhere its base at least is well preserved. In the thickness of the wall on the left (south-west) side are traces of the stair. A little further round a passage leads to a cell, the corbelled inner wall of which is exposed by the collapse of the outer wall. A signal station with concrete piles has been built over the broch wall on the south (left). There are no certain traces of outworks. This broch stands on a summit 168m (550 ft) above the sea and three-quarters of a mile from the shore of the east coast of the island (visited August 1969). It commands a fine view across the water to Mull and Colonsay, southwards to Kintyre and back across the island to Ireland. That this broch is another example of those which were much better preserved a century and a half ago is shown by Thomas Pennant’s description of about 1770 (Appendix 2). Level 1. The building is circular, the central court – though full of rubble – appears to have a diameter of 13.7m (44.9 ft) and the surrounding wall is about 4.8m (15.7 ft) thick on average. This is a large structure for a broch. The entrance is on the east-south-east and 4.42m (14 ft 6 in) in length, the width being 71cm (2 ft 4 in) at each end but wider in the middle. One door-check is visible on the left 1.2m (4 ft) in from the outside; it is faced with an upright stone slab. Although both faces are exposed there is no trace of a check on the right side, and neither can the bar-hole and -socket be seen. A guard chamber is on the left of the passage with the low doorway leading to it just visible; in 1979 the lintels of its roof were only 0.7m above the rubble on its floor. This doorway gradually expands into the egg-shaped cell. Ten years earlier the author noted that its corbelled roof (presumably the overlapping lintels mentioned below) still rose to 2.4m (8 ft) above that rubble. The Commission’s investigator noted that, at the inner end of the chamber, a little of its wallface had fallen away, exposing “an ascending series of lintels or treads above a void within the thickness of the wall; this structure may have carried a gallery over the guard-chamber and across the entrance passage.” . Part of another mural chamber can be seen at 11 o’clock and in 1969 the corbelled inner wall of this was visible; the right side of a doorway into the wall is at 12 o’clock. The author noted traces of a stair in 1969 but this is not mentioned in the latest account . A fragment of intramural gallery, or a cell, with a squared end can be seen between 12 and 12.30 o’clock and the inner wall of another short length of gallery at 9.30. Level 2. A scarcement about 60cm wide is just visible above the rubble, indicating that this must be about 1.8m deep. When Pennant saw the site in about 1770 the ledge was about 60cm above the rubble so much must have fallen in since his day (see Appendix 2). At present the inner face nowhere stands more than one course above the scarcement . The main wall was then described as standing 14 ft (4.27m) high and the entrance passage was still roofed with lintels. Pennant also describes a gallery running all the way round the wallhead. There is a wide quarry ditch on the north-west and north-east of the broch. If Pennant’s height of 14 ft for the broch wall in 1770 is correct – and even if he exaggerated a little and it was only 10 ft – the gallery he saw running round the wallhead must have been an upper one. Dun Bhoraraig must then have been the much better preserved stump of a broch tower. Dimensions. The overall diameter was given as 21.4m (70 ft) in about 1770 by Pennant. The author found it to be 22.0m (72 ft) in 1969 and the Commission – after surveying the site a few years later – gives the figure as 20.0m (65.7 ft). Sources: 1. NMRS site no. NR 46 NW 10: 2. Childe 1935b, 81: 3. MacKie 1975, 142: 4. RCAHMS 1984, 101-2, no. 169 and fig.